The “16 + 1” hole system means that the pad can be used with most common types of equipment. The holes in the paper should be aligned with the holes in the pad. Hard black interface pads, made from micro-rubber, are ideal for initial roughing up and evening out of the surface. 5mm thick. Thinner foam gives greater stiffness during operation, increasing durability. Thicker (more flexible) interface pads are suitable for both initial work, and for finishing gentle curves and profiles. 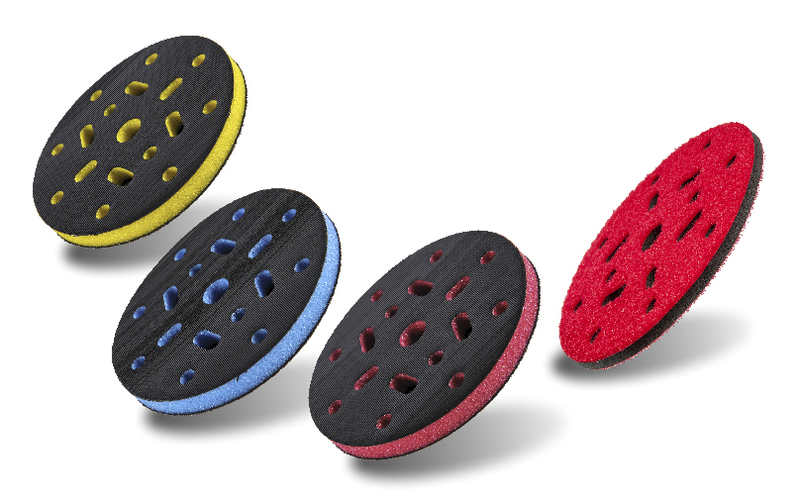 The blue, yellow, red and black interface pads are made from top quality materials. The foam was specially selected for its extremely high durability and resistance to dust, larger particles, water and high temperatures. Soft black interface pads are suitable for gentle sanding. They are designed for final processing and finishing. 10mm thick. All INTERFACE PADS are suitable for finishing. At URBAN we place particular emphasis on a durable mounting system (using the most durable Velcro on the market), and foam that gives the greatest degree of shock absorption for sanding.